The apartment is located in a finely renovated farmhouse overlooking the beautiful landscape of the Tuscan Hills. Located in an oasis of relaxation, it does not offer all the comforts of the city. A few minutes from the house are the Thermal baths of San Giovanni and Antica Querciolaia. The swimming pool is located in the large garden. The hause is also equipped with a private parking. The apartment is located inside a finely restored farmhouse overlooking the splendid panorama of the Tuscan hills. Located in an oasis of relaxation, it does not renounce to offer all the comforts of the city. 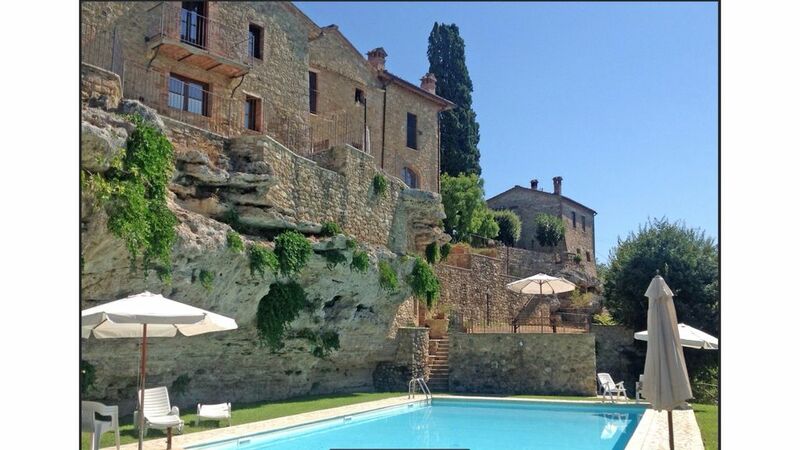 A few minutes from the farmhouse are the thermal baths of San Giovanni and Antica Querciolaia. The swimming pool is located in the large garden. The house also has a private parking. The badroom is equipped with a window overlooking the Tuscan landscape. Equipped with mirror, toothpaste and toothbrushes, shower, bidet and toilet. Available soap, toilet paper, hair dryer and a complete towel supply. The bathroom is provided with a window overlooking the Tuscan landscape. Equipped with washbasin with mirror, toothpaste holder and toothbrush, shower box, bidet and water. Available soap, toilet paper, hair dryer and a complete supply of towels. If you book a two-week spa stay, you will receive a discount on your stay. The convenience of managing self check-in and check-out thanks to the availability of a neighbor for key collection. You will find a short guide on the living room with some useful information. It will be a great pleasure for me to provide any useful information to make your stay unique. Visit of the cellars of Montalcino, purchase of the products directly from the producer. Restaurants and places of interest. Gezellig ingericht. Erg goed schoongemaakt. Voorzien van WiFi, vaatwasser, wasmachine. Het gezamenlijke zwembad is ruim en goed onderhouden. Het enige nadeel is dat je geen balkon hebt. Maar bij het zwembad is genoeg ruimte om buiten te zitten. De eigenaar reageert heel snel op mailtjes. Els si è dimostrato un ospite molto attento e premuroso. Ha lasciato la casa in ordine e pulita , rispettando gli spazi comuni . Le comunicazioni sono state sempre veloci e precise . Vi ringrazio di cuore per aver deciso di trascorrere le vostre vacanze nel mio appartamento e che abbiate condiviso un grande amore per la Toscana . Ospiti consigliati . Asciano, the country of Garbo, offers a wide range of evnts for the different periods of the year. COLLEGIUM VOCALE GENT organizes an annual music festival, born bv the initiatives of the Belgian conductor Philippe Heereweghell. Concerts are held in Asciano and Pienza. CYCLING, if your passion is cycling, you will discover the path of the Eroica, the path of Bonifica and the Val di Merse. The SPA, the water is the protagonist. A few minutes from the house you will find the spas of San Giovanni and Antica Quierciolaia, avant-garde fecilities for the care, wellbeing and relaxation of the person. A unique opportunity to regenerate, an ideal time to regain harmony and vitality. The TREKKING, the unique landscapes where the colors change with the seasons, the way of the Grancia, the Amiata Mountain or the Via Francigena. TRAINING, an old steam train that runs through the Crete and beautiful Val d'Orcia. The Abbey of MONTE OLIVETO MAGGIORE, a majestic monastic complex immersed in a dense forest of secular trees. The FOTOGRAPHY, landscapes and places where the facsinaton of nature and the ingenuity of the man leave breathless. The ideal place for those who love to immortalize the beauty of nature and the architecture of the cities. BALLON IN TUSCANY, ballon flights to the different cities of Tuscany. CRETE of AUTUMN, a calendar of gastronomic events to discover the excellence of the cuisine of the territory. The village of Garbo proposes a wide choice of events for different periods of time. You will be happy to give you all the information you need. of the year. The COLLEGIUM VOCALE GENT organizes an annual music festival, created by the initiative of the Belgian conductor Philippe HerrewegheIl. The concerts are held in small ancient churches between Asciano and Pienza. Cyclotourism, if your passion is the bicycle, you will discover unique itineraries such as the Eroica trail, Bonifica trail, and Merse valley. TERME, water is the protagonist. Just minutes from the house you will find the San Giovanni and Antica Queciolaia thermal centers, state-of-the-art facilities for the care, well-being and relaxation of the person. A unique opportunity to regenerate, an ideal time to regain harmony and vitality. TREKKING, unique landscapes where the colors change with the seasons, the Grance Way, Mount Amiata or the Francigena Street. TRAINING, an old steam train running through the Crete and the beautiful Val d'Orcia. THE ABBEY OF MONTE OLIVETO MAGGIORE, a majestic monastic complex immersed in dense forest of centuries-old trees. PHOTOGRAPHY, landscapes and places where the charm of nature and the ingenuity of man leave you breathless. The ideal place for those who love to immortalize the beauty of the landscape and the architecture of the cities. BALLON IN TUSCANY, hot air balloon flights on different cities in Tuscany. CRETE OF AUTUMN, a calendar of food and wine events to discover the excellence of Tuscan cuisine. FOOD, OIL and good wine, Tuscany is a very generous land, you will meet an endless choice of food and wine proposals, savoring the food directly from the producers and the wines in the cellars. I will be happy to give you all the information you need to make your stay enjoyable and to know in the most genuine way the tastes and flavors of Tuscany.